They serve as a replacement for the root of the missing tooth. Other tooth replacements like dental bridges and dentures sit on top of the gums and recreate the appearance of a natural tooth. But because they don’t reach the jawbone, the bone can start to weaken and deteriorate from lack of stimulation. On the other hand, dental implants are anchored by a post or screw that is placed in the jawbone and acts like a natural tooth root. The contact of the implant with the jawbone keeps the bone stimulated and prevents it from deteriorating. The placement process is more involved than that of a bridge or denture. Because dental implants are anchored in the jawbone, the process to place them is more involved than that of a dental bridge or denture. Implant posts are placed during a surgical procedure performed by a qualified implant dentist or oral surgeon. It takes time for the post or screw to fuse with the bone and create a solid foundation for the eventual replacement tooth. Overall, the process can take three to six months or more. 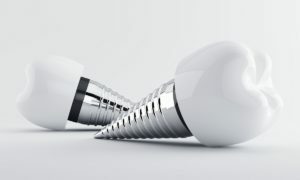 Implants are considered a permanent solution. Dental implants are designed to be virtually permanent. A properly placed and well cared for implant can last a lifetime. They help keep the jawbone healthy, which is good for the health of the rest of the teeth in the mouth. And because they stand alone, they do not wear down or weaken the adjacent teeth. Unlike dentures that have to be carefully brushed and soaked, or bridges that need to be regularly repaired or replaced, implants are hassle-free. They can be brushed and flossed like natural teeth and cannot develop cavities. Dental implant treatment is customized to the unique needs of the patient, based on factors like how many teeth need to be replaced, where they are located in the mouth and the number and type of implants used. What is right for one person may not be for another. If you are interested in discussing your tooth replacement needs with a trusted implant dentist, Dr. Ayoub invites you to schedule a consultation at his San Francisco dentistry practice. Please contact us today to make your appointment.